Busy week! All my children have officially started school!!! Very exciting. I’ve been baking cookies all week, and today I start on cake. It’s so hot too, ugh. Wait, it’s hot and humid. Seriously at 7:30 this morning I was soooo hot! And tomorrow is supposed to be worse. Stay cool! Don’t forget my giveaway! I think there are only 3 or 4 entries! This entry was posted on August 8, 2012 by katespadegirl. 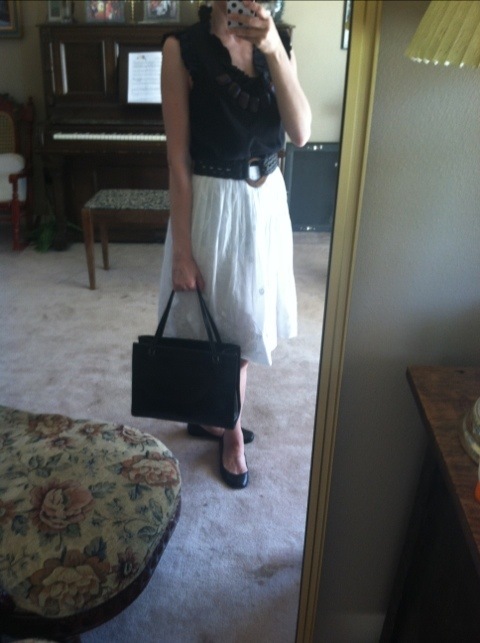 It was filed under Outfit of the Day and was tagged with Banana Republic, Jimmy Choo, Kate Spade, Old Navy.